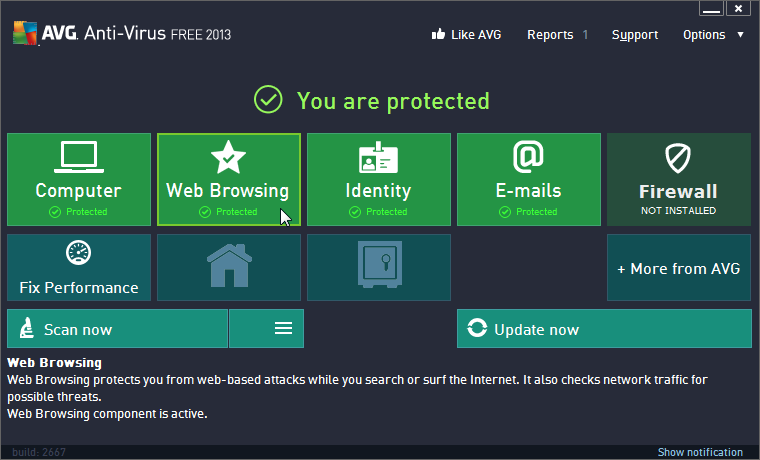 I am using free AVG for may years.in my laptop. It is a good antivirus and give full security to my system. Unfortunately, today AVG is not what it used to be a few years ago. However, it still offers decent virus protection. I have been using this AV for years. I have realized now that these vendors are in overdrive mode, cramming more aggressive features that mess up with the OS and other security software. This one would cause freezing of my OS (Win8 on a Dell Inspiron 3537), each time there was a major AV update. I then switched to Avira, and found it turned ON the Windows firewall, although I had Comodo FW installed, and then the frequent freezing and crashing of the OS, disabling of my touchpad etc. I have now decided I had enough of this overly aggressive junk, and installed Panda cloud AV. Although it is just a few days old, I faced no such issues. I suppose a cloud based AV loads a lot less stuff on your PC, and therefore is lighter and less prone to causing problems of incompatibility and the like. I recommend all those who have faced similar issues to use a cloud based AV, with Comodo FW (which has some AV features) with a back up scanner such as Malwarebytes, and a browser protection software - Malwarebytes Antiexploit. and I guarantee, you will be free of problems. This irritating and poorly written garbage software keeps changing IE Tabs to open in a blank page instead of my set home page. This has been going on for many versions of this abysmal software and AVG is completely deaf and uncaring to fix this bug even though I have written and notified these idiots many times. I am starting to hate AVG. I used McAfee for years until I found this. I've been using it for the past year on three machines and have found it better and easier to use than McAfee. I'm using 2014.0.4336 and all seems to work flawless, with all it's modules and services is consuming 184MB of memory, not so high for an AV. And it's free, that's good enough for me. A very poor and irritating program, and I hope that AVG will read about my two big issues with their poorly designed and irritating programs, as it applies to all of their security program versions. 1: Why in the world does your Toolbar keeps changing my new opened IE Tabs to open a blank page. I change my Tabs options to open in my home page, but your lousy and irritating Toolbar keeps reverting new Tabs to open a blank page. Why in hell do you allow this to happen? 2: Why you stupid sadists not allow your users to customize our Toolbar. I do not want the ugly Facebook icon to appear, and you stupidly do not give me any options to remove this ugly icon. I will never use your horrible and irritating programs. simply WILL NOT install on my Win 7 64-bit, machines. Even a clean Windows 7 installation breaks these versions of AVG (although earlier versions from last year will still install). Also, from other internet reports, it seems that I'm not alone in having AVG's install fail. Moreover, I'm not going to bother trying this version, as it and earlier versions are not the full package but just downloaders. Fileforum, why this change, won't AVG let you have the real thing? If AVG cannot even get the program's installer to work without error messages then it says precious little for the product as a whole! 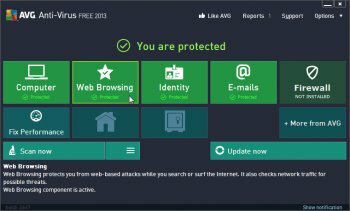 I used to recommend AVG to clients but no longer. Even when I'm able to install it, it's now a dog of a program to use. Also, yuh really have to wonder what the hell's going on at AVG when the installer repeatedly crashes across multiple machines. After all, antivirus software is usually renowned for its ruggedness for obvious reasons. Sorry there's no zero star. The AVG LinkScanner, the horrible, lousy, irritating piece of s*** add-on toolbar that is included in this program must be fixed and stubborn AVG refuses to fix this garbage add-on because they make money out if it while infuriating their customers and users. This garbage add-on insists on adding s***ty icons that cannot be removed or customized, like "Facebook" which I hate, and "Performance" which is actually and ad for AVG for more garbage software. A message to AVG: **** you and give your users the option to customize this garbage ads-on and remove ugly icons we do not want. Now go to hell AVG. Used v9 (the last decent version) up until recently, dumped in early June for Avast. Ever since they went to the year-numbered versions, the product has been junk. Also very bloated and comes with a bunch of crapware (toolbars/search engine pages/etc.). THEY HAVE TOTALLY SCREWED THE POOCH... THEY NEED TO GET BACK TO REAL BASICS AND STOP FOISTING CRAP ADD-ON INTO OUR PC'S.... ENOUGH ALREADY..!!!!!!! STOP THE INSANITY...!!!!!!!!!! !